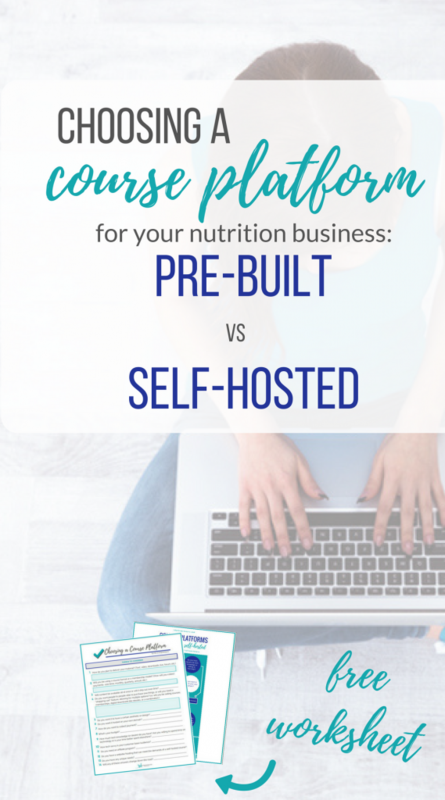 Choosing an Online Course Platform for Your Nutrition Business: Pre-Built or Self-Hosted? Online courses and membership programs are all the rage right now, and for good reason: they’re scalable (meaning you can create them once and sell them over and over), they’re virtual (meaning location isn’t limiting), they’re easily accessible, and they’re convenient (both for the creator and the customer). Online courses and programs can be especially appealing to nutrition entrepreneurs as a way to increase your offerings, broaden your potential customer base, add value to 1:1 programs, or to diversify revenue streams. RDs and nutrition professionals are currently offering online courses and membership programs across the board, from PCOS to mindful eating, flexible dieting to fitness programs, food sensitivities to fertility, and tons more. But the big question is – WHICH online course platform should you use? Will it be a course format or a membership model (one-time payment or monthly, quarterly, annual subscriptions, etc.)? Will content be available all at once, or will it drip out over time? Do you want it to have a certain aesthetic or design? Do you want it hosted on your own domain? How do you want to collect payment? How much tech knowledge (or desire) do you have? Are you willing to spend time on technology or is your time better spent elsewhere? How tech savvy is your customer base/audience? Do you need an affiliate program? If yes, what affiliate features do you need? Do you have a website/hosting that can meet the demands of a self-hosted course. Here are some of what I consider pros for Teachable. – Built-in sales page: you don’t need to design a sales page from scratch, it’s incorporated right into the site. You can insert different modules, add images, html, your course curriculum, buttons, and more extremely easily, and it links directly to your payment processer. – Built-in payment processor. PayPal and Stripe (aka credit card) processing are built in – you don’t need to do anything fancy or use additional services to be able to collect money. – Ability to offer different types of content – video, text, downloads, etc. – Lots of people are using Teachable now. This could be a pro because people already have user profiles and are familiar with how to navigate the platform. This can be con because for the most part, your course will look just like every other Teachable course. – Lives on your own url (or subdomain if you choose), meaning people never have to leave your site. – Need to build your own sales page – pro if you like to customize and are comfortable with the technology (essentially like a blog post, not high level tech), con if you want it pre-made. – Integrates with certain email providers but not others. Some more “looks” at Memberpress: Note these will look completely different depending on your design! I’d summarize by saying Teachable is a little more intuitive than Memberpress, but you get better control + customization with a self-hosted plugin. If you don’t mind learning technology or already have a comfortable level of tech knowledge, a self-hosted plugin won’t be that big of deal to use. If you have ZERO interest in tech or struggle with that area, I’d automatically lean towards a pre-built / third party platform like Teachable. While I have a lot more “Pros” listed under Teachable, the self-hosted option wins out for me. If my business was only partially based on online programs I would be more inclined to go back to Teachable because it is SO EASY. Plug, play, forget. Someone else handles the tech and there’s a support team. I see the value in paying that monthly fee now much more than I did before. If you’re only occasionally going to be using courses, HATE tech and don’t want to pay someone to do it, I’d recommend Teachable. I’d also recommend Teachable if you want to easily be able to bundle courses, provide easy upsells, or have multiple types of digital products. More thoughts. Will I stick with Memberpress as my plugin? * I should also add that my personal “tech skills” level falls somewhere in the mid-range. I’m no guru, but I’ve had years of expereince running my own sites/blogs and I’m a master Googler, so it’s not completely foreign to me either. So bottom line. Sticking with Memberpress for now, but looking into other options that will allow more features for the future. Launching a course or program soon? (Or thinking about it?) Check out LaunchRX!